You will need a suitable battery for your maritime vehicles. The best marine battery allows your boat’s system to function at its most efficient. A good marine battery not only essential to start and to power up a boat but also provide quality performance as well as a longer lifespan. In this guide, we have looked into hundreds of marine batteries for boat and select on the best to be included into the list below. Some of the batteries we’ve listed are dual-purpose batteries. 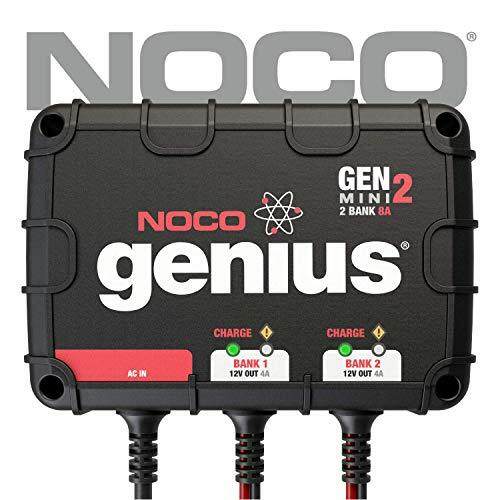 These dual-purpose batteries are designed to both crank an engine and for use as a deep cycle power source for trolling motors, electrical equipment and appliances. If you want to know more about automotive batteries, check out these articles – Best Car Battery, How to Recondition Batteries and How Long Does Car Battery Last. So how do you go looking for the best fit for your water-based vehicle? Start with marine battery reviews of course. There are many types of marine batteries to choose from, as well as many places to buy them too. You can buy them in your local auto shops or browse online in stores like Amazon and Autozone. All of our top recommendations include information on each battery’s cranking power and reserve capacity. We’ve also included detailed reviews of each battery that go into more detail about its specific strengths, weaknesses and unique features. Starting, dual purpose or deep cycle: Which battery is best? 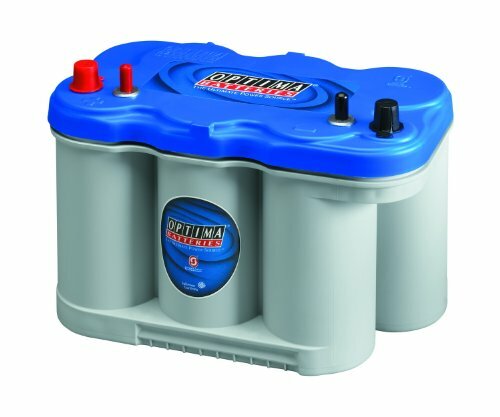 What is the best battery for a boat? Well, the most straightforward answer would be to get a durable marine battery from one of the top brands. If you’re looking for the best deep cycle marine battery, one of your sure options is this battery. 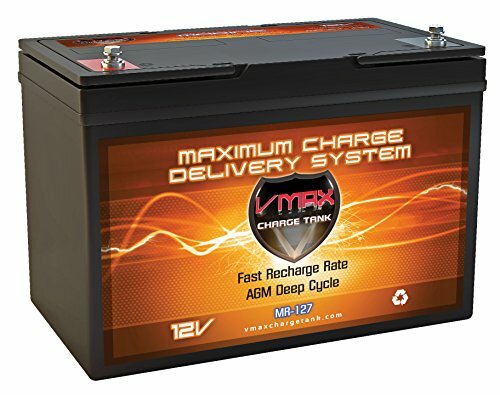 The Vmaxtanks SLR-125 is a 12V with 125Ah battery. Also, this AGM battery is made for heavy-duty use. This battery created to be high performing and durable with its military-grade custom plates in place. It’s designed to give off zero fumes and gases that can be dangerous to your health. Plus, its float service can last for up to 10 years. It’s a good battery to consider when you want to replace your old one. An expensive price tag isn’t the basis for how great a battery can perform. This battery from Interstate proves that. This non-lithium battery is highly dependable and is known for giving excellent service to its users. It lasts for a very long time and is one of the most affordable batteries out there today. 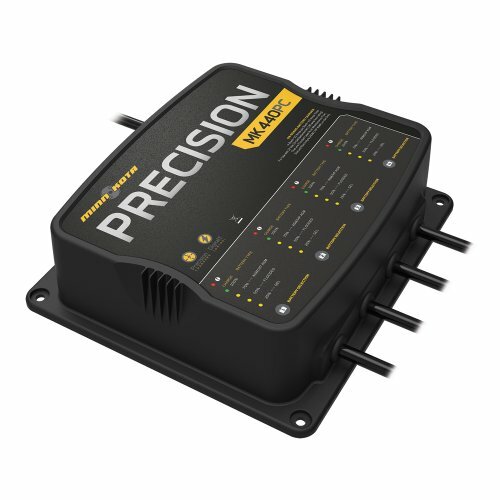 You can use it for a ton of applications like both ground and water vehicles, farming equipment, lighting, and even medical machines. Indeed, this battery is one of the best marine battery in the market. 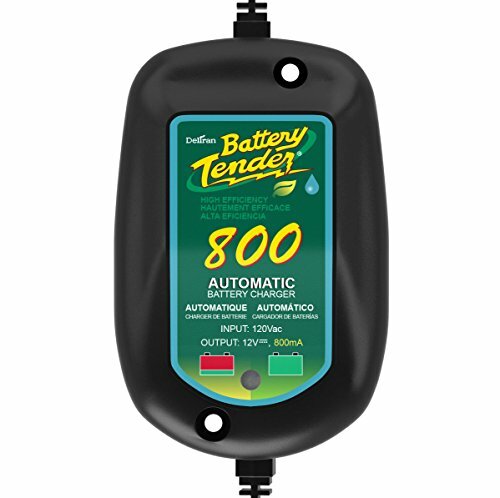 This 12-volt 55Ah battery is rechargeable and maintenance-free. Of course, that doesn’t mean you don’t need to do regular maintaining. However, if you want less hassle, then this battery is perfect for you. It’s spill-proof, and you can mount it in any position. This AGM battery has a high discharge rate, great recovering capacity, and can resist shocks and vibrations. It can even perform well in different temperatures, both high and low. Plus, it has an impressive full one-year warranty. This deep cycle battery is another fantastic choice to look into. At 12-volts with 100Ah, it provides a powerful service to your marine vehicle. It’s also spill-proof, and maintenance-free so you don’t need to put too much effort into its care. You can mount it in any type of position which is beneficial if you have a non-regular hood. It can even resist both shocks and vibration. 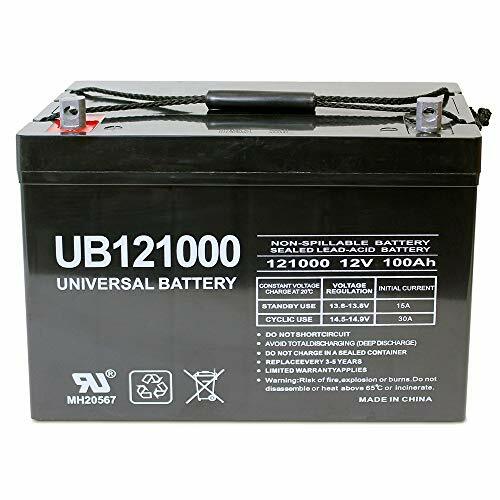 The Universal UB121000 comes with an excellent one-year warranty. This battery from Odyssey has a massive CCA of 1150 which makes it work extremely well in the cold and hot weather. It also has a longer cycle life than most deep cycle batteries. In fact, it lasts longer than 70% of batteries in the market today. Also, not forgetting to mention that you can recharge your battery super fast. In just 4 to 6 hours, your battery rate can reach 100%. Plus, this battery brand has an excellent warranty deal: a limited 3 and 4-year full replacement warranty. This 12-volt 100Ah powerhouse from VMAX is highly durable and heavy duty. It uses an electrolyte suspension system that consists of AGM technology that completely absorbs and contains the electrolyte. It’s maintenance-free so you won’t need to put a lot of effort into a routine. Also, it’s made from sturdy material like the heavy duty lead-tin alloys used as grids. Best of all, it has very convenient carrying handles for easy installation and replacement. The Optima 8016-103 D34M BlueTop has 750 cold cranking amps rating. And, this battery is an excellent starter battery for boats, RVs, and mechanical equipment. At 750 CCA, this marine battery will perform well in the cold weather and it can withstand vibration well due to AGM technology. Also, this battery has 120-minute reserve capacity, giving it a sufficient amount of reserve storage for use with a trolling motor. This battery comes with a 2-year warranty as well. The Excide XMC-31 is designed to charge quickly and can retain more power if compared to its similar class from other battery brands. This battery is built with strong exterior housing keeps this battery safe and protected, with excellent resistance to vibration and wear. It also uses the AGM technology to prevent the battery from drying and it’s maintenance-free. Also, this battery can last for 200 minutes of regular use (25-amp continuous draw at a temperature of 80°F). Best of all, the Excide XMC-31 comes with a 24-months warranty. The Optima 8052-161 D31M has 900 CCA and 1000Ah marine cranking amps which make it a powerful battery for starting outboard motors and other demanding equipment. This battery has a 155-minute reserve capacity at 80°F and 25 amps, giving it ample of power for deep cycling and powering trolling motors. Also, the thick and solid and durable plastic exterior can withstand constant vibration without any problem. This Optima 8052-161 D31M comes with a 2-year warranty. The Optima 8027-127 D27M utilizes a pure lead spiral design that allows the lead to be used its pure form. This spiral makes the battery resistant to vibration hence extending its life. 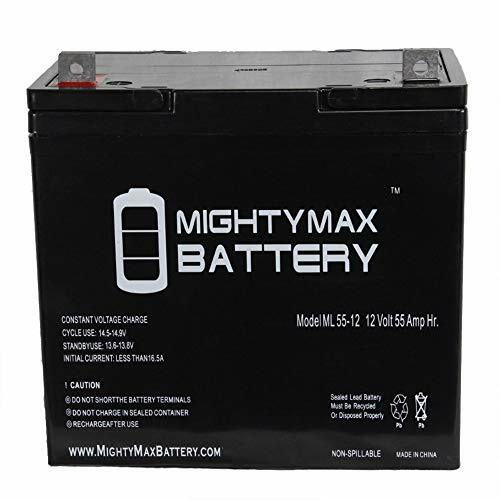 Also, this battery has solid cast cell connections that provide increased durability and maximum plate height. The standard voltage of the battery is 12 Volts. When the battery fully charged, the voltage can go up to 13.5 Volts. It also has a reserve capacity of 140 minutes which can be excellent for deep cycling and powering trolling motors. The Optima 8027-127 D27M uses AGM technology hence making it completely maintenance free. The Vmaxtanks MR107 is a 12 Volt marine battery, maintenance-free and can re-charge very fast. It is capable of delivering up to 85Ah in a single charge, enough for a more reliable and effective machine-starting experience. It also comes with a carry handle that makes carrying and replacing the battery easily from your boat. Best of all, this battery provides strong power for deep cycling and is built for heavy-duty use. 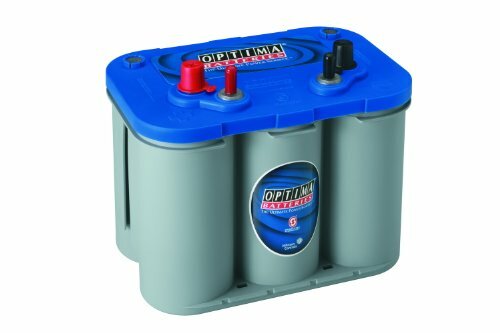 The Optima YellowTop Batteries 8040-218 D35 is an excellent 12 Volt marine battery and has 650 cold cranking amps. This makes it a powerful battery for starting small to medium sized outboard motor. What’s nice about this model is that it’s small and lightweight making it very portable. Perfect if your boat or cars has only limited space in the battery compartment. Also, this battery has a reserve capacity of 98 minutes which is an excellent choice for powering smaller trolling motors. This battery made with AGM technology and came with a 36-months warranty. Marine batteries can vary hugely in quality and performance. Therefore, it’s essential to be aware of the key features of a good battery before you make a purchase. There are a few factors you might want to consider when buying your marine battery. CCA or MCA (Marine Cranking Amps) determine your battery’s capability to provide power during a short period. It is an exact measurement of the amount of electrical power a battery’s lead-acid can produce in 30 seconds at 0° Fahrenheit with the voltage not dropping below the 7.2-volt threshold. In addition to CCA, some batteries are rated in marine cranking amps (MCA). This is a measure of a battery’s starting power at 32 Fahrenheit. Most batteries with a CCA rating of 700 or more can comfortably start almost any small to a mid-sized outboard motor. Another factor to think about is if you’d be starting your engine during the summer or the colder season. Starting your boat during the winter will require more power. So, the higher the CCA rating, the greater the starting power of the battery. Make sure to keep in mind the CCA rating of the battery model you’re thinking of purchasing. 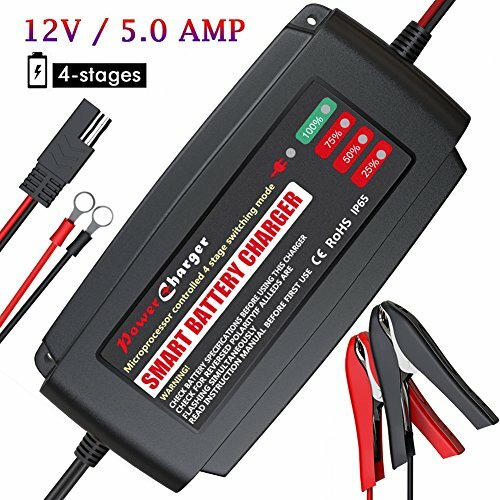 A battery Reserve Capacity or also known as RC, is to measure the amount of time required for a fully charged marine battery when dropping below 10.5-volts while discharging 25 amps. If you want your marine battery to perform longer, you’ll need a higher Reserve Capacity battery. For boats that have many electronic equipment, it’s essential to have a high Reserve Capacity battery to supply enough electricity for all the electronics. Over time, batteries gradually begin to lose their effectiveness and stop being able to maintain a charge as effectively as they once could. Even if the batteries are new and unused, a battery that’s one year old won’t perform as well as one that was just delivered from the factory. Always check the manufacturing date to ensure the best possible performance from your battery. Batteries that are less than 6-month-old has the best performance and can offer excellent starting power or reserve capacity. The older lead-acid type of batteries requires regular maintenance like filling up the acid water. However, the newer AGM (Absorbent Glass Mat) type of battery is maintenance-free, making them much easier to own and use. Also, AGM batteries are built tough and leak proof and can withstand constant vibration. More info about AGM battery, here. Some high-end batteries are even designed with a watertight seal that allows the cells to continue operating even if splashed with water. Amp hour rating is only applicable for trolling batteries. It is an exact measure of how much amperes a battery can provide for 20 hours. Usually, a higher amp hour rating is the way to go. Turbulence and storms cannot be wholly avoided when riding a boat. Impacts such as these can easily compromise the performance of your batteries. Having a battery that is durable and vibration-resistant can help it perform better because it can absorb the shocks. Thus, battery life can also be lengthened. Of course, you should also look at the price of the battery you want. Batteries come in different price points. Make sure to get one that fits your needs as well as comes within budget. Looking into warranty details can also prove beneficial in the long run. Some warranties provide generous services to customers while others do not. Aside from the factors mentioned above, it is also good to familiarize yourself with a few additional features your battery might have. Know what purpose you’re getting the boat battery for. Is it for cranking your engine? Or is it for keeping the boat running throughout the duration of your ride? Some batteries are designed for only cranking or starting your engine. That means these types won’t work at their best for longer periods. Some batteries like the deep cycle ones or the dual purpose ones can work both for cranking and powering up your boat for longer. Like car and truck batteries, marine batteries also come in different sizes. For example, the most common size is the 24M, 31M, and 65 among others. Before replacing your old battery, determine its size first. An ill-fitting battery will not work as great as one that fits perfectly. The sea is a very treacherous and unpredictable place. But you can still observe the environment you’ll regularly be using your boat in. Rougher and more turbulent waters may need a more powerful battery than a calm and tranquil lake. Of course, you should also bear in mind the possibilities of water get splashed onto the batteries. So getting a waterproof battery is a must! Proper care and maintenance of your battery can mean the difference between it having a longer or shorter lifespan. You can determine the maintenance instructions of your chosen battery before buying it so choose wisely. So, what is a deep cycle battery? A deep cycle marine battery provides continuous 12v power to your boat for a more extended period of time. It has thicker but fewer plates. This type of battery can be completely drained and recharged a lot of times. A deep cycle battery is much less likely to overheat too. Just like starting batteries can’t deep cycle, deep cycle batteries are not designed to start an engine. This means you’ll also need a starting battery to crank your boat’s motors. A marine starting battery can also be called a marine cranking battery. It allows your boat to start, which means it sends power to your boat’s engine when the ignition is turned on. A starting or cranking battery provides short and strong bursts of power. It has thin plates so that it can give stable and reliable performance. Since starting batteries are designed solely to start an engine, you’ll need a separate deep cycle battery. 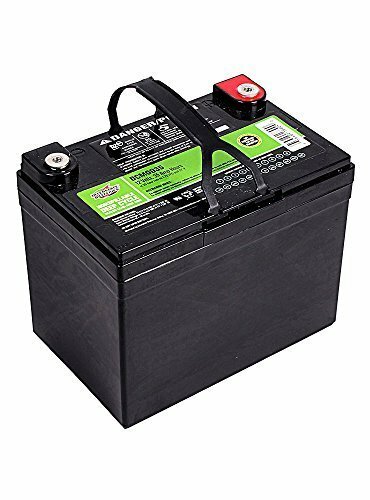 The deep cycle battery is needed to power up any 12v appliances and trolling motors once the starting battery is turned off. Dual purpose batteries are designed to offer the best of both worlds. A dual-purpose battery is designed to provide a large amount of starting power and also to power trolling motors and other electrical appliances. While the dual-purpose batteries offer excellent performance as both starting batteries and deep cycle batteries, but it has its downside. Dual purpose batteries will not perform as well as a dedicated, single-purpose battery at either task. A trolling motor battery is used to power up your trolling motor. A trolling motor is an electric motor that is used to move a boat through the water. The best trolling motor battery is usually chosen between 2 types of deep cycle 12-volt batteries, either a Lead Acid Wet-Cell or an AGM battery. A trolling motor battery can discharge small amounts of current for an extended period of time. The best battery brand for you is still a preference only you can determine. 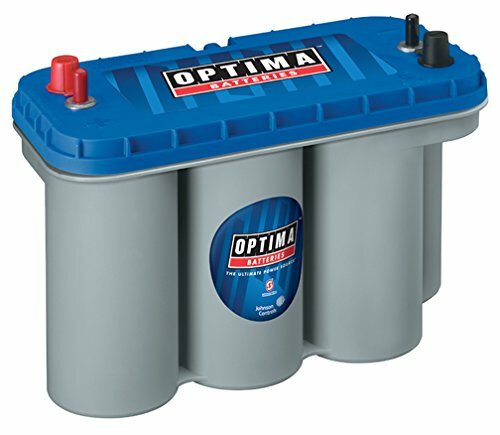 Optima batteries are recognized as one of the long-lasting marine batteries in the market. This brand uses a proprietary technology – Spiralcell and Pureflow to allow Optima battery to have superior resistance against shock and vibration and enjoy a longer lifespan. 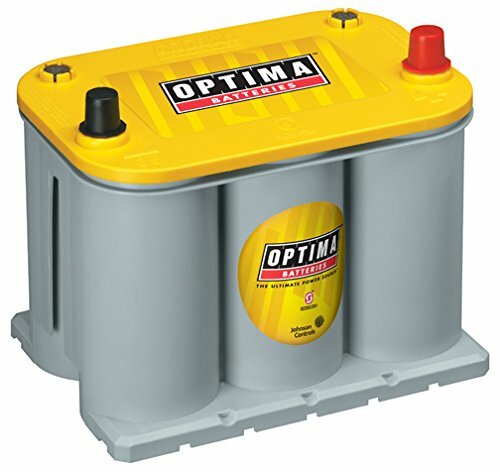 Also, due to the AGM design, Optima battery does not leak or release any fumes even when tipped. 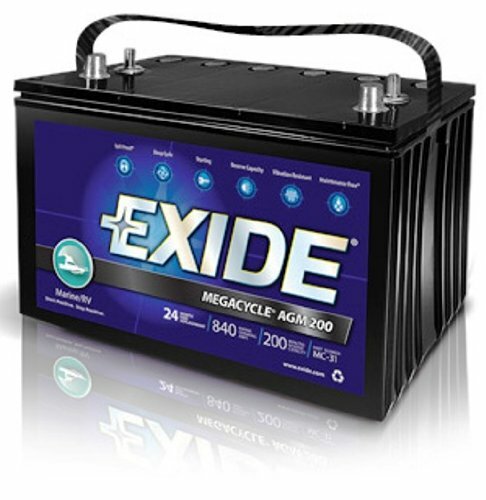 Exide Technologies is one of the well-known manufacturers of lead-acid batteries. This brand headquarter is in Georgia and has recycling facilities throughout the US and other parts of the world, including Australia and Europe. Like many famous battery brands, Exide Technologies provides you with high-performance and stable batteries performance. Also, the batteries are maintenance-free. 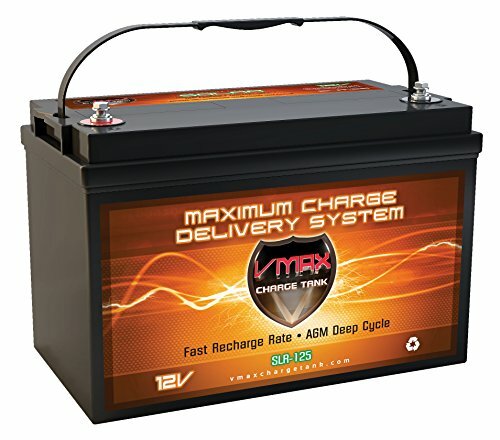 Vmax is well-known for manufacturing deep cycle capabilities batteries that are high-performance and suitable for heavy-duty needs with exceptional power. 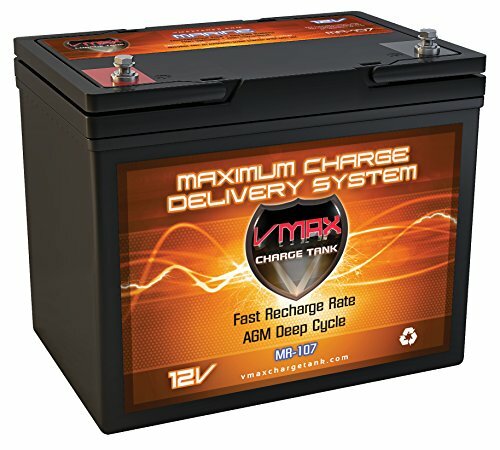 Vmax uses the AGM technology for their battery and it’s maintenance-free without the needs to add any battery water. You can confidently count on Vmax battery to provide adequate power for all the lights, the trolling motor, the refrigerator, the water pump and more for your boat. Also, Vmax marine batteries are dual-purpose which is excellent for cracking and trolling use. You would probably hear of Odyssey as this is one of the oldest battery brands in the market. 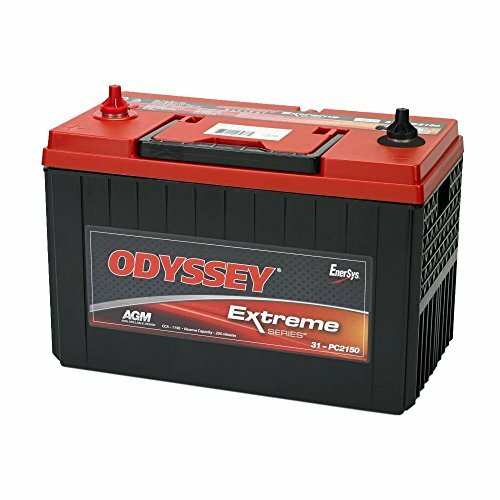 Odyssey marine battery is well-known around the globe and Odyssey has service stations in over 10 countries. The Odyssey batteries are well known for its recharge efficiency. For example, the famous Odyssey 34M-PC1500ST can store up energy without a recharge for 2 years! Also, their warranty is very attractive; you get a 3 or 4-year full replacement warranty, just as long as you meet the terms. There are also other best marine battery brands like the ACDelco, Lifeline, Superior Superflex and Trojan you can check them out too. To understand a little bit more about marine batteries, it’s good to know how a marine battery is structured. This will help you understand better how the battery works, and why there are many things you need to consider when it comes to buying one. Container. It is made from polypropylene and is divided into six cells. Positive plate. It is made from lead and other metals to help conduct charge. Negative plate. It is made from lead and other metals to help conduct charge. Plate separators. They are used to prevent short-circuiting from happening and are made from thin materials that make for great insulators. Electrolyte. It is a solution made from sulfuric acid and water and is the reason for the chemical reaction that makes electrons. Together, all five help convert chemical energy into electrical energy to keep your boat running. There are many types of marine batteries that you can choose from. Each of them will have a unique set of pros and cons. Of course, performance and durability can also be affected with who the battery’s manufacture is. Flooded batteries are also called wet cells. To make electrolytes, they use liquid sulfuric acid to create a path between the positive and negative plates. The electrolytes created then produce both hydrogen and oxygen while charging the battery. Flooded batteries require constant maintenance and the refilling of distilled water. Lithium Technology batteries use lithium-ion and are one of the most lightweight varieties of battery there is today. It can discharge about 800 times at 100% and even recharge in an hour. Lithium-ion batteries work the best with electric boats. The biggest downside of a lithium battery is the cost. It’s an expensive battery. Gel batteries use a mix of sulfuric acid, fumed silica, phosphoric acid, and pure water to create an electrolyte. The gel-like substance has a very sticky consistency which prevents leaks from happening. This type of battery lasts longer than its AGM counterpart because it has an improved heat transfer which makes it great for performing in high temperatures. An AGM battery is the abbreviation for Absorbed Glass Mat. They are also called starved electrolyte. The defining characteristic of an AGM battery is the very thin fiberglass mat situated between the positive and negative places. AGM batteries are made to withstand vibration which is good for the boat as it’s constantly rocking on the water. 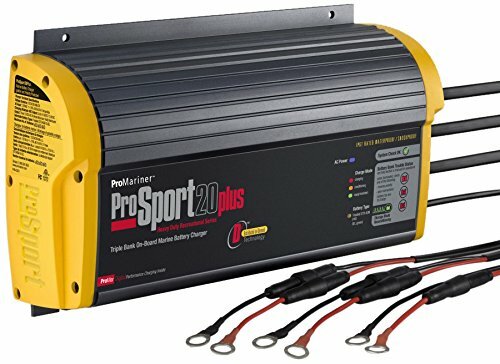 How Do You Calculate Amp Hours for a Battery? Firstly, determine how much amp hour you need. Just add all your 12V accessories and multiply that by 20. When you have that approximation, look for a battery that can provide you with an amp hour capacity that’s 20% more than what you need. A marine battery charger is an essential accessory to have in your boat, as it helps recharge your marine battery whenever needed. If you want to keep your battery working for longer, you should aim for shallow discharges. You should also never mix old batteries with new ones. Want to find the best marine battery charger for you? They may not look deadly, but batteries contain highly toxic and dangerous chemicals that may cause harmful effects on you and the environment. That’s why it’s important to make sure that the battery you’re buying is safe to use as possible. Make sure that all components are working correctly, and that there are no leaks. If a part of the battery is broken, contact the manufacturer at once and have it replaced.